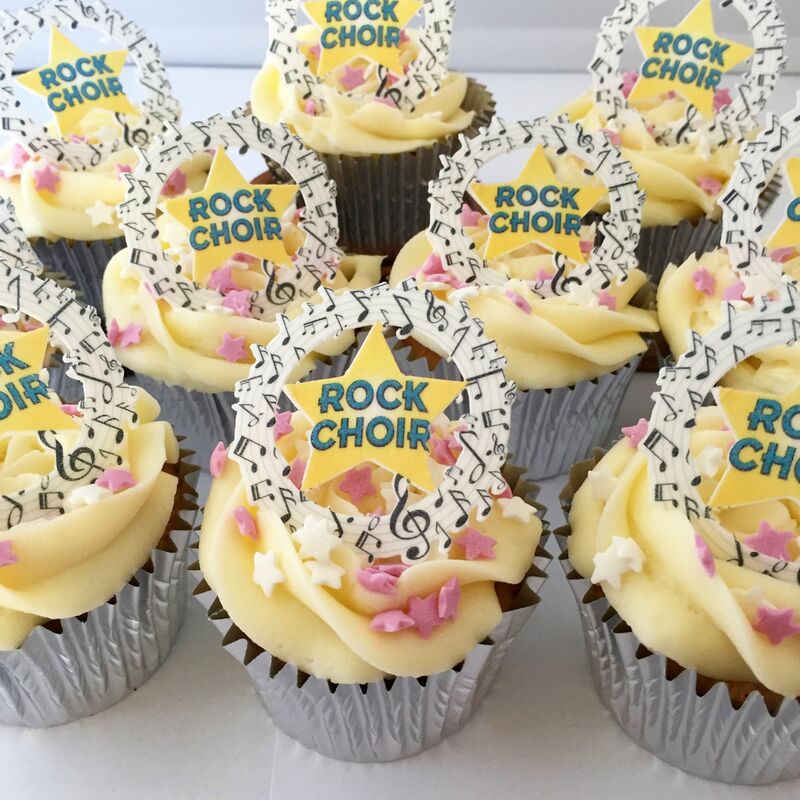 These Rock Choir cake toppers would look fantastic on your assortment of cupcakes for that Fundraiser or cake sale theme. This selection is part of our cake range. Each cake topper is approximately two inches high, come in packs of 12 and are printed with our high quality edible inks on either wafer paper or icing. If you can't decide which to have it may help to say that the toppers made out of icing look fabulous when used to decorate a larger cake. They can become part of a theme which anyone would love for their birthday tea. The Wafer paper toppers look great on a cupcake - they will stand upright. Some of our customers use this idea to decorate place settings at a birthday table! These other Rock Choir toppers complement our new addition to this range of cupcake toppers – if you want to have a look at those then click on https://www.creativetoppers.co.uk/edible-cake-toppers-decoration---logo---rock-choir-452-p.asp and it will take you straight to the right place! How about using them with an associated theme?? Then click here https://www.creativetoppers.co.uk/musical-cake-topper-1470-p.asp to see our musical cake topper which can be personalised for your own theme. As with all of our cake toppers these Rock Choir edible cake toppers are printed on either edible wafer card or icing using our high quality inks. They have a long shelf life of at least 6 months so as long as you keep them in a dry place (not a fridge) and in the packaging that you receive them in then you should have no trouble in keeping them. Our cake toppers are Kosher, gluten free and suitable for vegetarians.